Apart from firs, spruces are the highest tree in Poland. And those growing in the Bialowieza Forest are particularly impressive. Here in the forest the biggest sizes they reach growing in the company of huge oaks, pines and limes. A moot point is the maximum height of Bialowieza spruces. According to some sources they reach 52m, other mention even 57m with the maximum age of 300 years. But we must point out that so far some complex research have not been carried out. 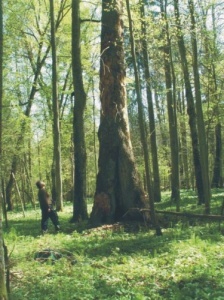 However we can say that some Bialowieza spruces reach the height of almost 48-50 meters. Recently I have taken the measurement of one of the spruces growing in the Bialowieza National Park and the result is 48-49 meters. I repeated my research 5 times and every time I received results of 48-52 meters. It is a beautiful tree, which has not only a magnificient height but also a monumental trunk size(361cm in perimeter at the height of 130cm). In total I have measured a dozen or so spruces so far with the use of clinometer and only 25% of them were trees with their height exceeding 45m. Taking into account my limited measurement range, it is not difficult to accept the fact that some of the forest spruces might be 5-6 meters higher than my height leader(if it turns out true we should look for the highest tree of Poland not in the mountains but in the Bialowieza Forest). The matter of the trunk perimeter of the forest spruces is less disputable. 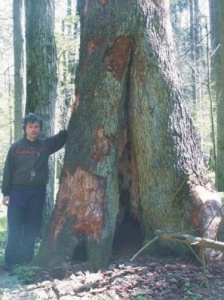 The taken measurement of the trunk perimeter at the height of 130cm of one of spruces in the National Park showed 430cm. Unfortunately a few years ago this tree withered. At present the thickest spruce I know has perimeter of 430cm(at the height of 130cm). Its chief asset is a special trunk symmetry what is very seldom in case of spruces with this kind of perimeter. With no doubt you can say that nowhere else in Poland or even Europe, this kind of trees reach such sizes.